Healthy Aging – With An Excellent Private Chef! As we get older our ability and desire to negotiate huge supermarkets and grapple with heavy bags of shopping frequently diminishes; particularly if we have limited mobility or suffer from joint pain and arthritis. Couple this with the time spent preparing vegetables and standing by the stove cooking and its little wonder that so many seniors simply stop eating healthy and nutritious meals, opting instead for frozen ready-meals or, worse, snacking instead of eating regular meals. Unfortunately, many frozen meals and other pre-packed products are high in calories, salt, sugar and artificial preservatives. They may be easy to prepare, however eating these items regularly, instead of fresh, well-prepared meals can lead to weight gain and malnutrition, eventually culminating in or exacerbating ill-health. In many areas, the local authority provides a meal delivery service for seniors. They are usually relatively simple and cheap to organise but these meals tend to be generic, made in bulk, fairly repetitive. 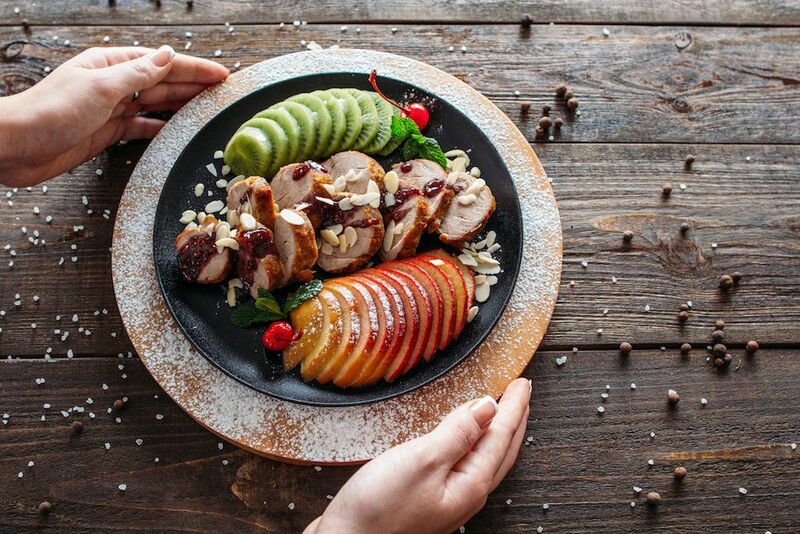 Many seniors experience a diminished appetite as they age, and at this stage it is important to have access to tempting meals, cooked with fresh ingredients. Ideally we all benefit from a wider variety of choice and the option to choose the type of meals that we truly enjoy eating. Have You Considered Hiring A Private Chef? It is perfectly feasible to employ a Personal Chef to prepare custom home-cooked meals for your loved one and the cost of doing so is often far less prohibitive than you would imagine. Many seniors find it difficult to get to the supermarket due to mobility or transportation issues. Even negotiating a large shop can be stressful and for many seniors this underlying stress often prompts ill-advised dietary choices. Meal planning can be done in advance, with expert guidance. Choices will be based on the favourite foods of the recipient but will be made with fresh and healthy ingredients in mind. The personal chef will organise the purchasing of the ingredients removing the stress that can be associated with shopping. Many seniors find standing up for extended periods difficult. This can turn food preparation into a daunting task. It can take far longer to cook even a simple meal if there are mobility issues to take into account. Some seniors, faced with these difficulties, may become frustrated, stressed and eventually avoid creating quality home cooked meals; particularly when living alone. It can be safer to leave the preparation to a third party – mishaps are far more likely with frail or shaky hands and weakened limbs. A personal chef can customise all meals to the client’s specific dietary needs. Meals can be planned with any intolerance catered for. Food preferences and dislikes can be fully catered for. Some medications may become unnecessary after a period of healthy eating. Calorie counts can be adapted for those who are less agile without making the recipient feeling deprived. Meals can become more personal and enjoyable with the inclusion of specific ingredients and preference. Some seniors enjoy a very active or social lifestyle and hiring a personal chef will provide them with plenty of additional leisure time. No grocery shopping, no food prep and no hanging around waiting for meals to cook. This time saved can be spent relaxing, socialising or taking a healthy stroll! A chef is trained to make the most out of every ingredient which will eliminate waste. Only the required ingredients will be purchased in the first place, avoiding impulse purchases, which may eventually get thrown away, unused. Some meals work better when cooked in bulk – a chef can prepare the meal and freeze portions for later use. It’s rare to find anyone who enjoys cleaning up after meal preparation. Many seniors find it difficult to stand and wash dishes and then put them away. Even dishwashers can be hard to manage with larger or heavier items. A personal chef will take care of all of these details leaving your loved one to enjoy their meal in the knowledge that everything will be cleaned up and returned to the right place afterwards. A side benefit of having a regular personal chef is the huge benefit of regular companionship. Many seniors suffer from loneliness and isolation. Having another person to chat to regularly can, in itself be of huge benefit health-wise. Strong and reliable friendships can flourish over time, providing reassurance in the knowledge that your senior loved one will have company for at least part of the day on a regular basis. Hiring a Personal Chef may not work for everyone, however it could be the perfect answer for anyone with a senior loved one who wishes to remain in their own home – despite being unable to cater to their own dietary requirements efficiently. For many people, the reassurance of knowing that their senior is enjoying a healthy and balanced diet, regular periods of companionship and aging healthily whilst retaining their independence, is worth its weight in gold!